As we learn more about antioxidants, other words like free radicals and oxidative stress often enter the conversation. If you recall from biology class, our bodies are composed of tiny particles called molecules. Each molecule is made up of atoms, with a nucleus (center) and electrons which spin around the nucleus. Normally, electrons occur in balanced pairs. This keeps the atom and molecule stable. When a molecule loses one of its electrons or gains an extra one, it becomes unbalanced. This unbalanced molecule is called a free radical. A free radical will naturally try to stabilize itself, taking an electron from some other molecule to restore its own balance. It is this electron theft that causes the damage in our bodies. The stolen electron comes from a normal healthy cell, damaging the cell in the process. This cell damage continues as the body tries to regulate itself. This condition is called oxidative stress. The end result is the body may become unhealthy and disease processes may begin. “The compounds in Aroniaberries have strong antiradical (free radical) potency. They continue to scavenge free radicals for longer periods of time.” Study: The Influence of Interactions Among Phenolic Compounds on The Antiradical Activity of Chokeberries (Aronia melanocarpa) (Jakobek, Seruga, Krivak. et al. 2011). Some free radicals occur as normal by-products of the body's metabolic process. 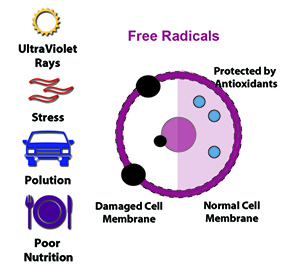 But the body can over-produce these free radicals when subjected to stress, poor diet, environmental pollution, sun exposure, trauma, illness, and disease. Unfortunately today, the increased stresses and poor diet can result in excessive free radical activity in the body. This is why our bodies need additional antioxidants from foods like the Aroniaberry. These berries provide the most balanced protection against free radicals.